This could be the foundation to a two-storey building. A two storey stone building with unusual windows has been discovered at an archaeological dig in the south of the county. Alderton Mount near Towcester, is an ancient monument which Northamptonshire Archaeology is hoping to continue digging at in future summers. It was a timber ringwork castle, occupied between the 12th and 14th centuries. The site's significance has been elevated by what has been unearthed. 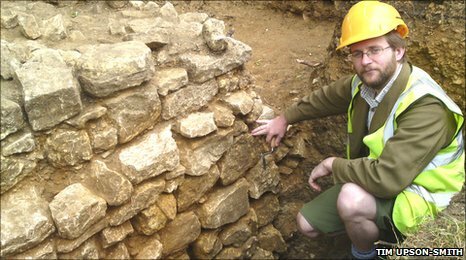 Tim Upson-Smith from Northamptonshire Archaeology is keen to spend more time in Alderton, having found a 12th century stone footing more than one and a half metres deep. "I'd love to open up around the wall we've exposed this year. It would suggest we've got a fairly substantial building, it'd be fantastic to see if we can get the extent of that building and find out how far back it goes." The dig relies on the goodwill of volunteers and Tim's had dozens over the three weeks, including residents of Alderton, people who helped out last year and students of Universities as far afield as Nottingham and Canterbury. The tree-fringed mount at Alderton has become a centre for the community again, more than 800 years after it's estimated that a castle first stood here. To walk around the mount, now covered in mature vegetation, it's easy to picture a bustling rural community. At its centrepiece stood a two storey building, unearthed over the past three weeks. Its painted windows reflected the status of its owner, at a time when the Norman conquest was set to change life in Northamptonshire permanently, with a legacy we continue to feel today.